Anyone who knows me knows that I’m insistent that I’m pregnant, not disabled or incapable of doing things that I did and enjoyed in the past. Okay, I won’t be climbing Mt. Everest anytime soon – no rock climbing or activities that put me up high and at risk of falling – but I can certainly still go out and enjoy drinks with friends. Just where they’re having the boozy kind, I will opt out of booze. Thankfully, the mocktail scene in NYC has been steadily ramping up over the past few years, when I first began taking drinking hiatuses. 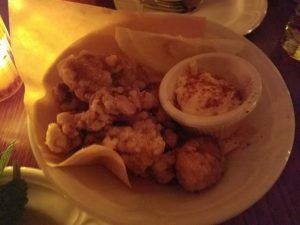 When HtG suggested meeting up for drinks, I quickly picked a place that I’d read has great mocktails — and snacks provided by the restaurant upstairs where I’d previously enjoyed the burger a few times. I didn’t take pics of Hubba Hubby nor HtG’s drinks, but if they’re not already I’ve a feeling you’ll see them on Hubba Hubby’s Instagram soon enough. My request to our server was simply no coconut, on the refreshing and slightly sweet side – and this appeared. While I laughed at the forest of mint in my drink, it was actually super well-balanced, tasty, tart and sweet all at the same time. Our server said it was cucumber, mint and passion fruit… some of my favorite things! 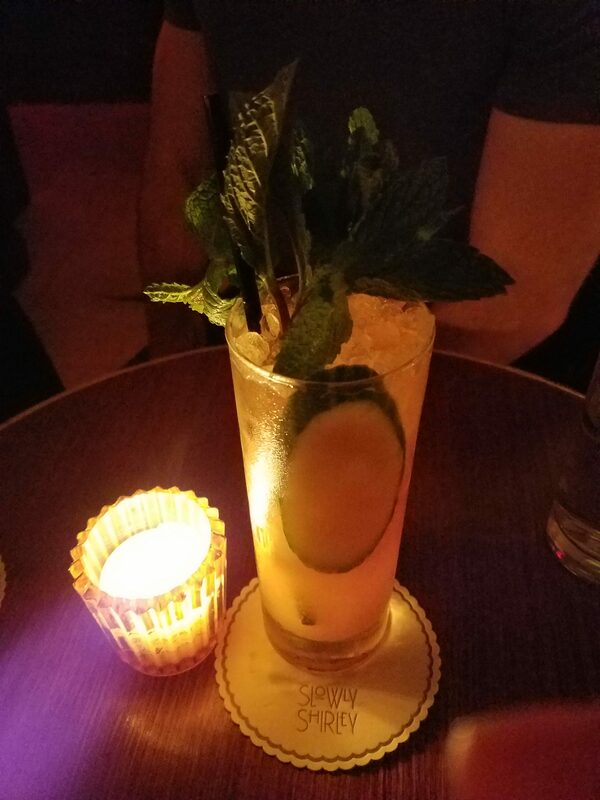 Well, actually, I don’t care for mint in drinks but aside from the huge bunch on top, it was barely noticeable and played nicely with the refreshing cucumber and tart/sweet passion fruit. I loved my drink!! 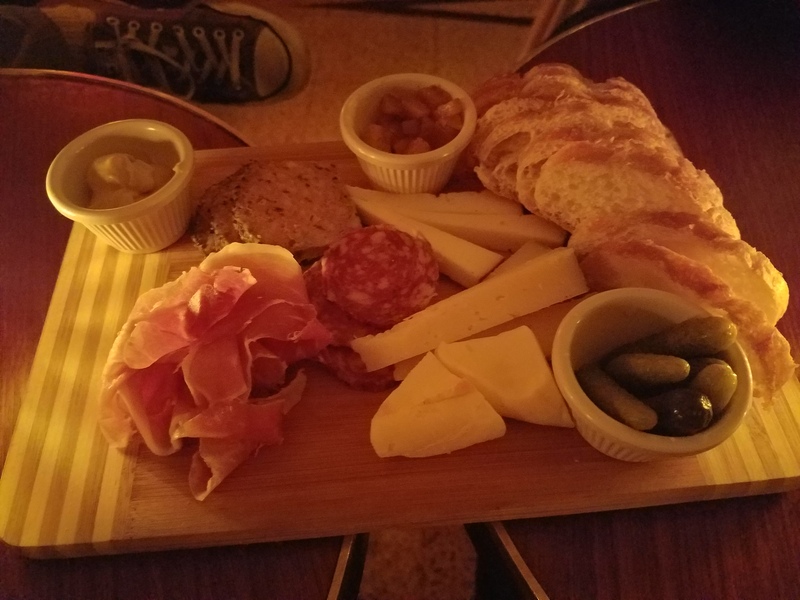 It was roughly dinner time, so HtG ordered the charcuterie & cheese plate. While I’m not sure how I feel about this clocking in at $32 (our drinks were $14-16, while mine was $10-12, I’m not sure), I did enjoy everything I tried on the board. There was a goat cheese, a manchego-style cheese with a lot of nuttiness, and all the components were chosen carefully to complement each other. I also ordered the bonsai chicken, which came piping hot with a side of Kewpie mayo – yum! Fried nicely and pretty light, but crispy and juicy, I really enjoyed these bites quite a bit. After a couple of drinks for the boys each, we headed to another place nearby to fill our tummies the rest of the way up — check back tomorrow to see where we went and what we had (hint: one of my favorite things, with another of my favorite things, one mediocre version and one really really good version!). While the prices can be a bit tough to swallow if you’re not super into cocktails and understand/appreciate all the work that goes into good ones, we enjoyed our experience there for the most part. The bartenders clearly know their way around the bar – with or without alcohol – and the space is dark, warm, with a fun vibe that’s not quite overly-inviting nor off-putting. We got there a little before 8, and by the time we left at 9, it was really hopping with young kids (part of why we left) – it was quiet when we first arrived, but got super loud as the night progressed unfortunately. Definitely check it out if you like really well-made cocktails. Any word on when it might be back up?